An appeal for baby hats. Hot heads: Calling all knitters! In the chilly mountains of rural Rwanda, where last year PIH's partner organization began working with the Burera District Hospital, resources are very limited and the temperature often drops into the 50s. Newborn babies, particularly those born prematurely, often struggle to keep warm. In a country where one in 10 babies dies before her first birthday, hypothermia is a serious threat. A simple solution that can help save some of these little ones is to provide them all with beanies to keep them warm. 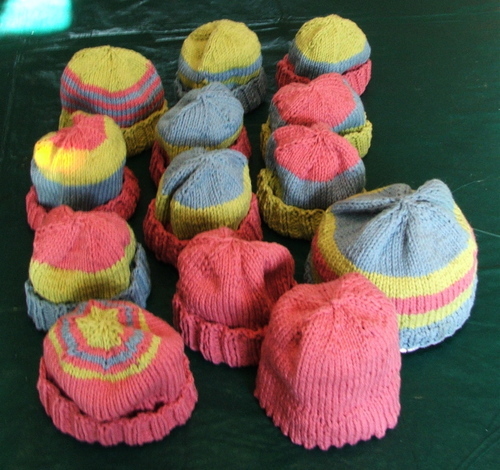 We are looking for knitters to help us put a warm beanie cap on every baby born in Burer--as is done in American hospitals. The Burera District Hospital welcomes about 100 new babies into the world each month, so our current goal is to provide 100 caps per month. All beanie styles and colors are welcome. Hats can be made to fit either premature babies (head about the size of an orange) or full-term babies (head about the size of a grapefruit). We will arrange shipping from Boston to northern Rwanda. Mountains Beyond Mountains takes us from Harvard to Haiti, Peru, Cuba, and Russia as Farmer changes minds and practices through his dedication to the philosophy that "the only real nation is humanity" - a philosophy that is embodied in the small public charity he founded, Partners In Health. He enlists the help of the Gates Foundation, George Soros, the U.N.’s World Health Organization, and others in his quest to cure the world. 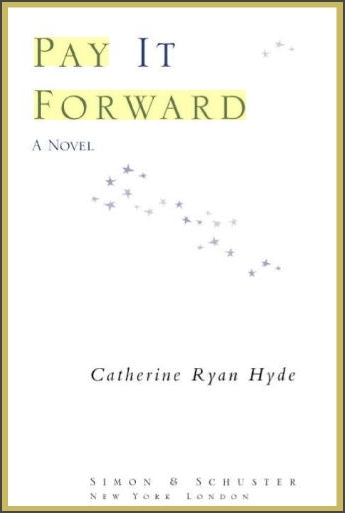 At the heart of this book is the example of a life based on hope, and on an understanding of the truth of the Haitian proverb "Beyond mountains there are mountains": as you solve one problem, another problem presents itself, and so you go on and try to solve that one too. One of Dr. Farmer's major contributions is to have figured out ways to deliver quality health care at a cost affordable in the Third World. People, that is HUGE. To summarize, PiH is a great organization that does excellent work. 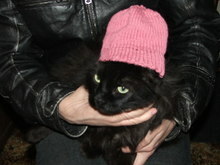 When I got their email about needing knitted or crocheted baby hats, I knew what I had to do: get the knitters on board! This project is a little different than many I see in blogland. Instead of needed X number of items by Y date, they need 100 hats every month. Can we do it? Of course. We can do ANYTHING! And that is why I won't be donating as many hats to the preemie project this January. There are some babies in Rwanda that need them even more. Is anyone else having trouble using their TypeKey id when trying to submit a comment on a blogspot/blogger blog? I have been unable to do that since ::counts on fingers:: last Thursday. What is particularly galling is that when I try, I get a TypePad "Oops" screen asking me what I was doing when the error occurred; when I type in "trying to submit a comment on a blogspot/blogger blog using my TypeKey id" and click on "submit", I get the exact same screen back minus my typing. In other words, my error submission doesn't go anywhere. There is even a little box to check if you want a reply from TypePad. Needless to say, I have gotten no responses to those error submissions. I finally went the the TypePad site and submitted the error on their generic "Contact us" screen. I did get a reply, but the person said she could not find any errors that had occurred. Well, duh, the error submission doesn't work. I have replied to her with the facts I outlined about. What are the odds that TypePad will actually investigate the problem? and solve it? In the meantime I have to submit comments using my Blogger id, which I suspect is why I am not getting many replies to my comments; I do not think it includes my email address. I have to do it this way because I am always logged in to Blogger because I am logged into Google Reader and Gmail. So, all you people with blogspot/blogger blogs? (Deb, Jocelyn, Cindy, cursingmama, Ruth, Big Alice, Mel, I'm looking at you.) (I'm looking at a bunch of others, too, but I got tired of linking.) What does this look like from your end? Horror. Younger Son, the one who bikes five miles to work in downtown Minneapolis every day, just phoned. A bicyclist was crushed by a semi at 14th & Park this morning. The online bike forums are buzzing. Younger Son is extremely safety conscious in his riding, but still. Horror. As many of you know, Claudia raises money for MS research in the annual MS ride. Generous knitters made her the #1 fundraiser last year, and she is aiming to do something similar this year. Last year I was lucky enough to win the grand prize, a beautiful gray alpaca shawl donated by Angela. After winning such a gorgeous prize last year I felt I needed to help out this year. I bought this off eBay. Then I found my copy. Duh. Then another package arrived in the mail. It seems I bought it TWICE on eBay. Double duh. As good as this book is, I definitely do not need three copies. Two of them are going out as prizes in Claudia's MS fundraising raffle/ride. So go! Donate! Win a prize! Besides my dumbass books, Grumperina has offered to knit a pair of socks for a winner, and there are other books and fun kits and gorgeous yarns waiting to be won. Let's help out MS research, since we all know what MS would do to a knitter. Random thoughts on the economy and the election. 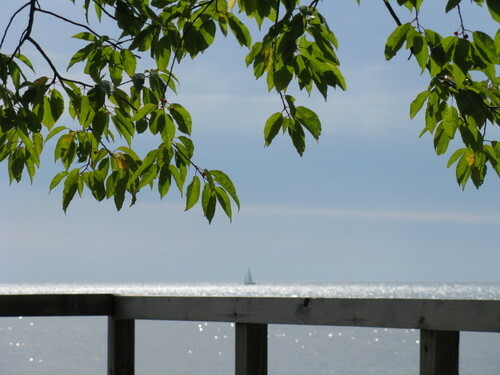 If you didn't happen to read Cursing Mama's blog entry on Sunday, please do so here. It would be good if you read the articles she links to, as well; it is good to be as well-informed as possible. Go ahead, I'll wait. Michael Greenberger served as the [Commodities Futures Trading Commission's] director of trading and markets at the time. A proponent of tougher oversight, he recalls the Greenspan-Rubin resistance as being fierce and across-the-board. "If we had prevailed, the [subprime-securitization] party would never have gotten started; the wildness wouldn't have happened," he says. "There would have been auditing requirements, capital requirements, transparency. No more operating in the shadows. Bear Stearns, Lehman, Enron, and AIG would be thriving, and spending every waking hour complaining about regulatory restraints imposed upon them." Remember Ronald Reagan, he who was the champion of deregulation? He who is so eulogized by the rightward half of the electorate? His ideas regarding regulation are not quite so, um, unassailable now. The problem with deregulation and self-regulation is that -- duh! -- people cheat. If enlightened self-interest is enough to ensure a well-oiled economy, why are exams proctored? Because people cheat. If self-regulation is so damned wonderful, why do we need police, huh? Because people cheat. People can be blinded by their own short-sighted self-interest, i.e., greed -- greed for what others have, greed for the profits-based bonus, greed for moremoremore. The other half of the equation, though, is election fraud. 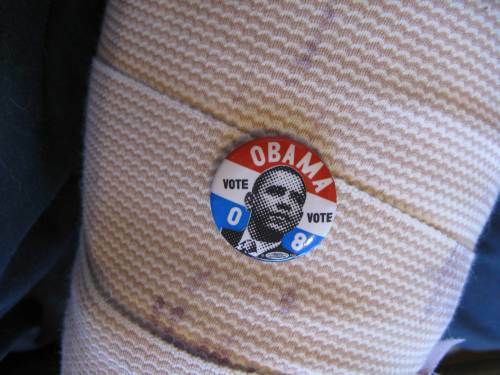 It is not enough that a majority of American voters cast their ballots for Obama. Their votes must be counted. If an election can be stolen (see: 2000; 2004) it will be. 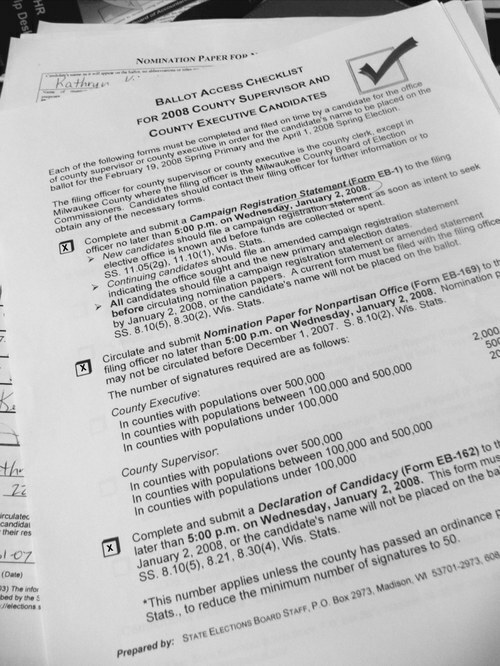 The early steps are already in the works -- flawed voting software with no paper or audit trail that could potentially alleviate problems; mandatory matching of a voter's every id point to existing databases, a process that has already been shown to eliminate massive numbers of legitimate voters; etc., etc., etc. Be wary. Be aware. Vote, drive others to the polls if they need a ride, be informed. Enough of that. Here is a child's sweater I started a couple weeks ago with the plan that it would be done by the October 1 deadline Afghan for Afghans' latest project, sweaters for school kids aged 7 to 12. I knit the body in about 30 seconds, then it languished in the knitting bag for a couple weeks because sleeves require So. Much. Concentration. [/whine] Maybe finishing this can be the silver lining in the broken ankle cloud. The stripe pattern is the Fibonacci sequence, something I have wanted to work into a knit garment since I first discovered it a couple years ago. Yeah, I'm a little behind the curve on that one. As you can deduce, the upper part of the sweater will be predominantly the pinkish-red color, although my row gauge calculations indicate that a little more blue will sneak in up near the neck. The pattern is a combination of the saddle-shoulder sweater from Ann Budd's A Knitter's Handy Book of Sweater Patterns for the sizing and EZ's knit-all-in-one-piece-in-the-round, saddle-shoulder pullover from An Opinionated Knitter for everything else. The yarn is Knit Picks Wool of the Andes worsted from stash in Blue Bonnet and Cherry Red. The needles are KP US#7. In my two years of blogging I have discovered that if I have pictures and an idea, the post writes itself. Tonight I have almost no pictures and very little in the way of ideas. Let's just see what happens, 'kay? I finished a really good book, Eye Contact by Cammie McGovern. I read about it on someone's blog, I think, and requested it from the library. It is a murder mystery of sorts, really a novel where a murder is one of the organizing principles, a mystery with more than the usual amount of really good character development and insight into those characters' souls. A little girl is murdered, and the only witness is an autistic boy. Well-written. I highly recommend it if you like mysteries that are not particularly bloody or graphic. I started back to work the day after Labor Day, half-time until mid-October. The half time is because of my county board commitments -- meetings, committees, budget. It is taking me a while to get back into the regimen of being a worker bee instead of the Queen of Leisure. I love the work, I just don't love work, if you get my meaning. Without photos, I can't show you my knitting. I finished a stealth project that is a birthday gift for #2's girlfriend. After the 16th I can show it to you. The scarf I talked about a couple weeks ago is a lot bigger now, and I did some creatively funky things with the laciness of it, all of which will be revealed... sometime. I finished the socks mentioned in that post which needed toes and knit the second sock of another pair mentioned there. I have not worked on the Summer Chevron; the weather has turned cool, so I have lost motivation. 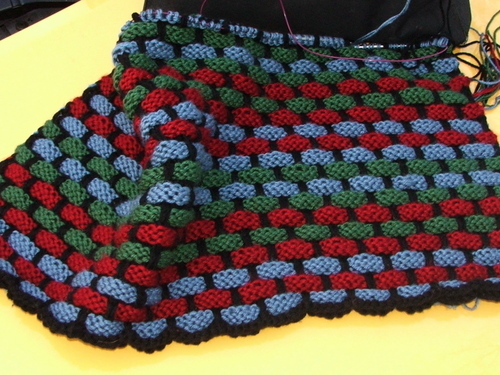 I still like the sweater a lot, so it will get finished sometime before next summer (she said confidently). 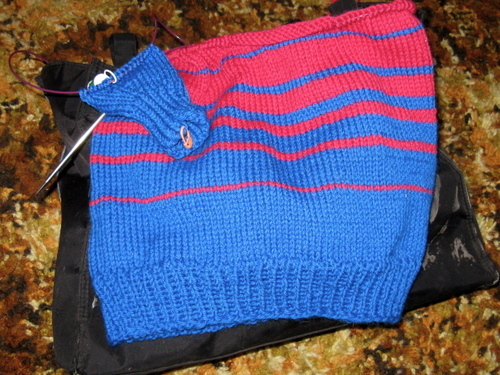 I started a child's sweater for the current Afghans for Afghans drive (deadline October 1) using Knit Picks Wool of the Andes from stash, a bright blue that is the same color as the blue of interstate highway signs and a cherry red. My charity knitting has been sadly neglected this year, and it feels good to be doing some. It is a saddle-shoulder pullover knit all in one piece using EZ's method outlined in The Opinionated Knitter. No seams, yay! 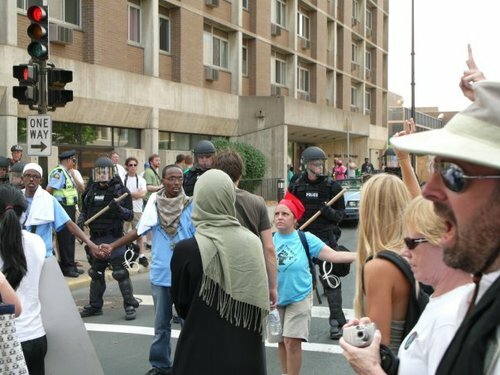 #2 son has some more pictures of the St. Paul police in their full riot gear at the RNC, but he has only been able to email me this one from his Blackberry. Grrrr. There are much better pictures in soxanne's post about participating in the September 2 march on the RNC; go check them out. A number of my friends here in Polk County marched in St. Paul, too; I didn't because I have trouble walking more than a few blocks. Those that did march have my undying admiration -- it was about 90 degrees that day with the same humidity. Oh, yeah, we went camping on the North Shore for 4 days the week before Labor Day. I have lots of pictures and things to tell you about that... when I have time. This will just have to do for now. It's the first week of February, ergo, I am wearing my CPA green eyeshade once again. The people I work with tell me that it is a mixed blessing to see me again every year. They very kindly say it is good to have me back, but it also makes it officially Busy Season. Ouch. 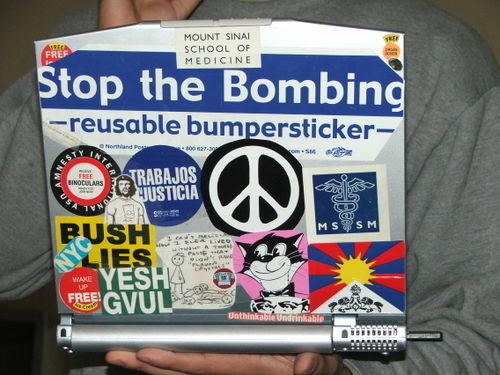 Andrew's laptop. Tell us what you really think, Andrew. Thanks to Cursing Mama for the link. And thank FSM for spell-check. The dog blanket that Amy asked me to knit for the Rolling Dog Ranch Animal Sanctuary has been my mindless knitting since I finished the preemie caps. An unexpected benefit of the Mason-Dixon ballband dishcloth pattern as interpreted in double-stranded acrylic is that the resulting objet d'knit is thick and squishy, just like a cushion. Perfect for a pooch's nap. When finished it will be ~30" square; it's about half done now. Smokey has remarked that our dogs each need a blanket like that. To paraphrase EZ the Great, another opportunity to do more of our favorite hobby. Catching up, vol. 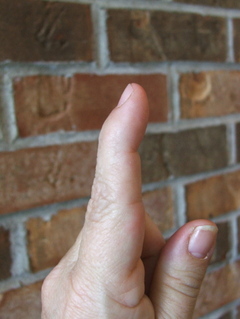 1: preemie caps. Hi, remember me? I used to blog hereabouts. Been busy the past coupla weeks. Gonna attempt to catch up. 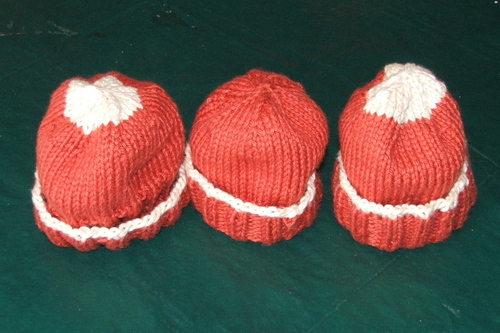 I knit up a whack of preemie caps for Jeanne. Now I just have to get my act together to send them to her. If my brain had been working properly I would have brought them to Amy's party on Sunday (details in another post), where I could have given them to Deb to deliver. That was in fact my plan, however, usual brain malfunction occurred and I remembered the caps when I was already 20 miles on my way. Must find box and tape and make expedition to post office. I started out about seven weeks ago with three skeins of Lion Brand Cotton-Ease. ...which Hannibal was absolutely delighted thrilled coerced to model for me. 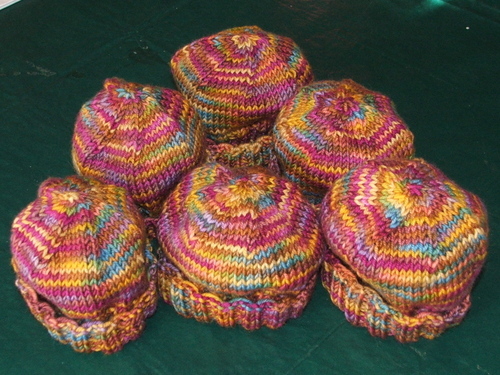 These were all made from the preemie cap pattern on Jeanne's site, a pattern that yielded the perfect hat; unlike the first pattern I tried, which yielded an object more suited to life as a kippah. We went to Chicago to visit Smokey's brother and wife last week because they wanted to see Andrew while he is home (another post). Chez Kat™ to BIL/SIL's house: 7-8 hours. What to knit in the car? More preemie caps, of course. Although I knit a lot in the car -- I think I only drove about 20 miles out of the entire trip -- I didn't knit all these on the road. I also knit on the train into the city (another post), while resting my feet at the Art Institute (ditto), while chatting with the relatives, while waiting for the waitress when we went out to eat, while watching TV, etc. I got a lot of knitting done. 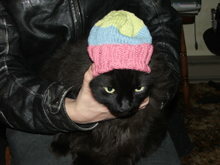 Here is the entire whack of Cotton-Ease caps, some of which were cat-modeled above. 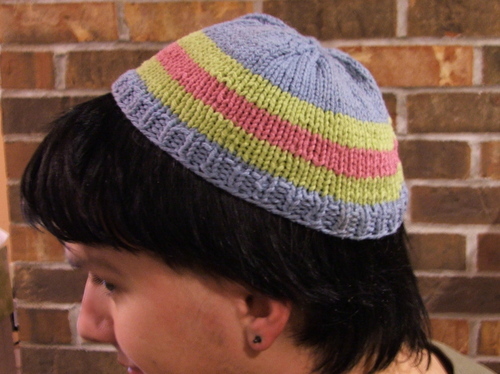 The kippah really stands out, doesn't it? They were all knit on US#5 needles, 56 stitches around, except that one honker. I messed about with a picot edge on the pink one in front just for fun. I finished up the Cotton-Ease, including the mangled tangled skein that En Esch had had his way with. Smokey spent the better part of two hours at his brother's house untangling it for me (just another reason why he is the Best Husband On The Planet), a time during which I knit most of another cap. Those things go really fast. 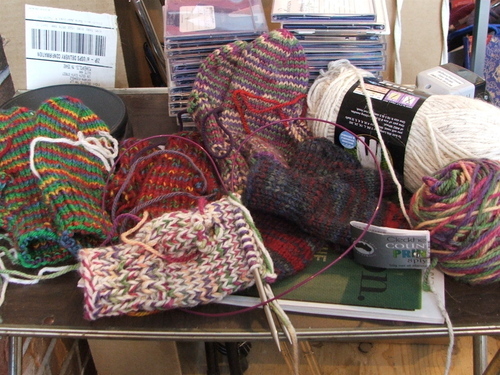 Next, I started on a skein of Socks That Rock heavyweight, color G-Rocks, that had been marinating in my stash for at least a year. Perfect for hats. 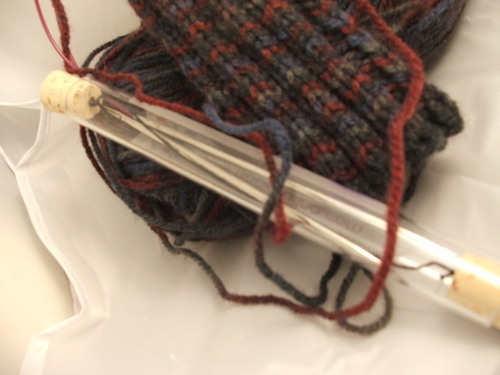 Knitting with this stuff was heaven. It knit up quickly at an appropriate gauge and size on US#3 needles over 64 stitches, and the yarn was pure bliss -- soft, sproingy (is SO a word! ), colorful, altogether delightful. 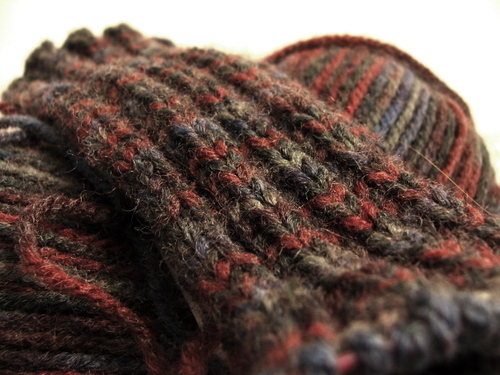 This close-up of the leftover yarn gives you an idea of the luscious texture and colors. I got six little caps out of a 350-yard skein. And a chorus of Awwww!s every time I held up a finished one. 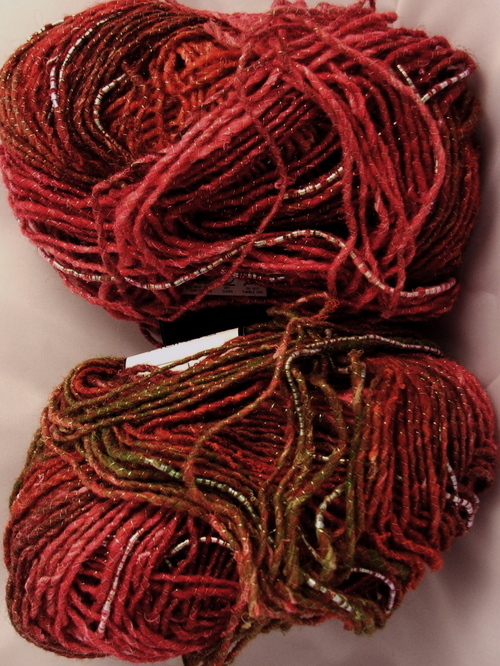 Okay, the Cotton-Ease and STR were gone; time to move on to Knit Picks Shine worsted. This is a cotton-modal worsted weight blend that Matthew picked out for his socks. (I finished those on the trip, too. Another post.) 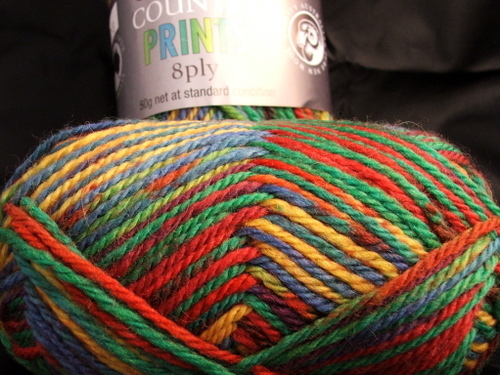 It is lovely soft, and I had bought a bunch of the on-sale colors. However, I had only brought along one extra skein of the terra cotta, plus the ivory left over from the socks. 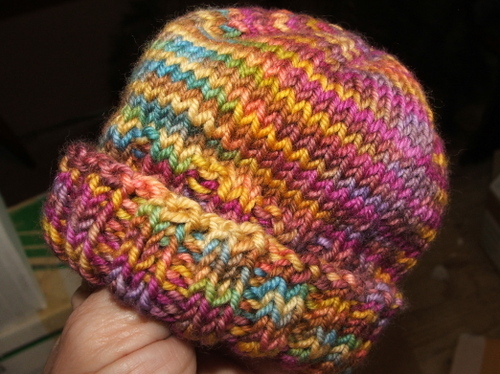 Given another week or three, I would have knit all the Shine into preemie caps, as it was that well-suited to the task. It is a loosely spun yarn, and hence splitty, but I got used to that and (*fingers crossed*) fixed any splits on the next round. 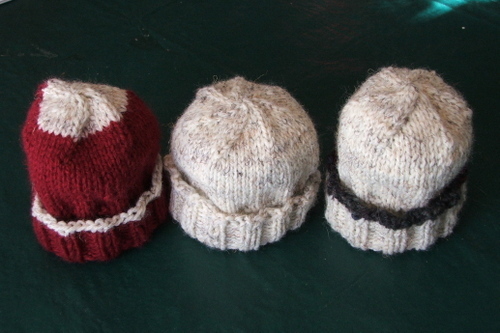 Like the Cotton-Ease caps, these and the three below were knit on US#5s, 56 stitches. Somewhere along the line in my preemie cap enterprise I tried Wool-Ease, but it wasn't as soft as the other yarns I had. Hence, there are only three caps in my Wool-Ease line. For those of you counting along at home, that is twenty-five (25!) warm little preemie heads, twenty-five (25!) little preemies who will have some help while their internal thermostats adjust to living in the cold world outside their mommies' warm floaty uteri. 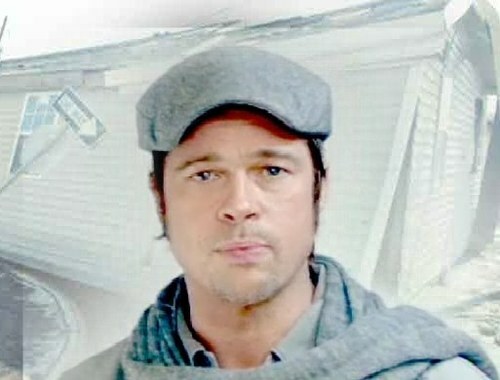 Brad Pitt loves me. He told me so. Well, he thanked me personally. Actually, I saw his thank-you video on the web. And I got a thank-you e-mail that had his name at the bottom. It's all about The House That Yarn Built at Mr. Pitt's Make It Right foundation (he said I have to call him Mr. Pitt; Honey Lambiekins and Lover Tomato make him blush). I read about it over at Norma's blog. Remember Norma, that non-Pollyanna who inspires us all to give 'til it hurts? 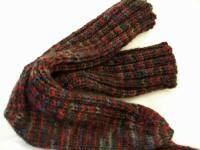 To knit red scarves for orphans and warm woolies for Mongolian kids and who knows what all? Yeah, that Norma. The Make It Right foundation is raising money to help rebuild houses in the Lower 9th Ward of New Orleans, where homeowners lost everything. (Read all about it at the linked sites in the previous paragraph; they explain it far more eloquently than I can.) In short, Christy of Misplaced Southern Belle is asking knitters to donate the cost of a skein of sock yarn -- or more, or less, whatever fits your personal budget -- to The House That Yarn Built at the Make It Right foundation. Since she knows that knitters are among the most generous, loving, nurturing humans on the planet, she thinks that we can and will help. So, let's do it, 'kay? Who needs that skein-of-sock-yarn money more, your feet or the devastated folks in NOLA? Bye now, gotta go get ready for the Party Of The Century, the first-ever gathering of Twin Cities area knitbloggers, at Amy's house. W00t! Matthew and I had waffles and bacon this morning. 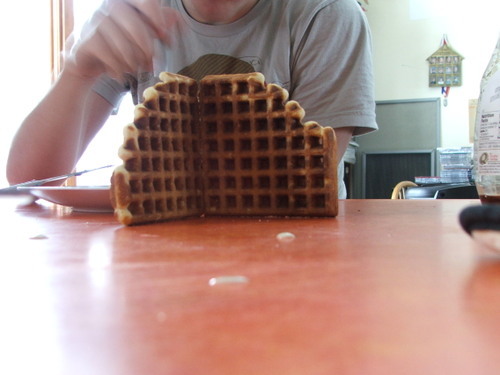 Some of the waffles, while tasty, were less than picture-perfect. They make good counter top ruined walls, though. Vicki wondered about that "current" thing that Chris mentioned in yesterday's comments. If you do not reside in the Twin Cities area you probably were wondering, too. 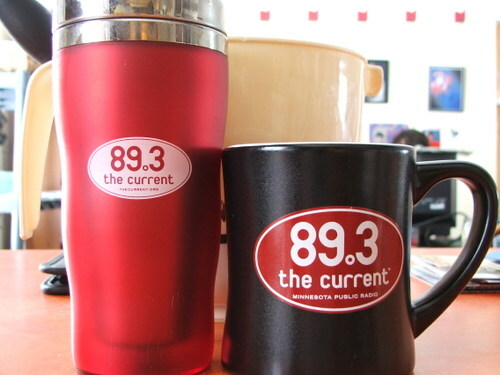 Eighty-nine point three The Current is Minnesota Public Radio's non-classical, non-news station. (The classical station is KSJN, 99.5; news is KSJR, 91.1; I knew you wanted to know.) It plays a wide range of contemporary music, from Frank Sinatra (rarely) to hip hop (less rarely) to alternative rock (as I type they are playing something by Eddie Vedder) to indie (lots). Startitis struck again: last night as I was reading in bed (at 1 am) I kept thinking about the dog blanket I had bought yarn for yesterday. So I got up and cast on. The blanket is for Rolling Dog Ranch, the charity that Amy picked for me to pay it forward to. The sharp-eyed among you may be able to pick out the pattern, which is a well-known one. Steve of Rolling Dog specified that the blanket should be washable, so I'm using (arg!) black Red Heart ack doubled-stranded for the background and Caron Simply Soft (much nicer! 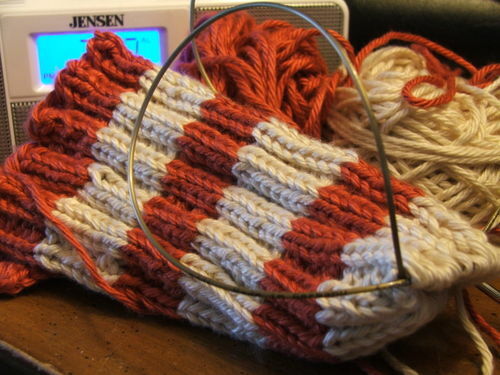 ), also double-stranded, for the stripes. A good, fast, and mindless knit on US#10-1/2 needles. Note: the only worsted-weight washable black yarn available to me at 7 pm last night at Wal*Mart was the Red Heart. Mea culpa. Yesterday I made another preemie cap for Jeanne. Here it is, being modeled by Matthew's fist. That makes up for the one that En messed with. Thanks to those of you who volunteered to untangle that skein for me. I wasn't quite ready to give up on it yet, but hey! 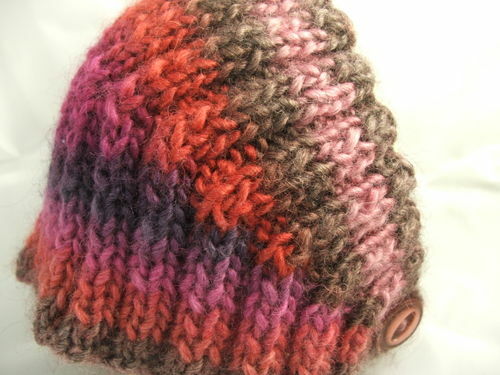 if you'll promise to use it for a preemie hat and send it to Jeanne, first one to send me her snail mail addy gets it. 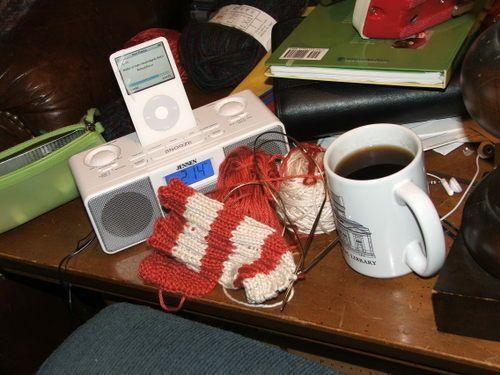 Randomness: painfully convoluted sentences, John Mayer, ponderous thoughts, and even a little knitting. 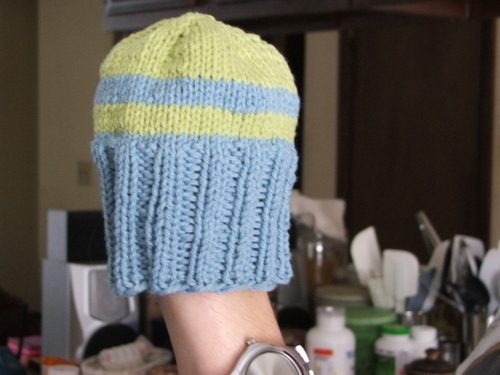 The sweet knit hat -- intarsia? stranded? -- worn by one of the graffiti artists. Yeah, I later realized it is really a ski mask, but still, it is an objet d'knit, and we all loves us some objets d'knit, doncha know? The skyline of NYC looking like something is missing, and we all know what that is, and it saddens us. That album -- or "alblum," as my dear MIL used to pronounce it, and so did my husband, who argued with me for an amazingly long time that "alblum" was a perfectly valid alternative to "album" and whom I only convinced otherwise when I dragged him, alblumming all the way, to the dictionary -- came to live in my iTunes a week or two ago and I have been listening to it and smearing the music and lyrics all over myself, it is so good. But, hey, I'm not all about the lyrics. Listening to his pre-song comments in this video of "I'm Gonna Find Another You" I realized that, Doh, of course I like that song, it's... blues. Now, as promised, a little knitting. Go on, knit her a couple. Quick, easy, stash-busters. You know you want to. Deadline is January 15. 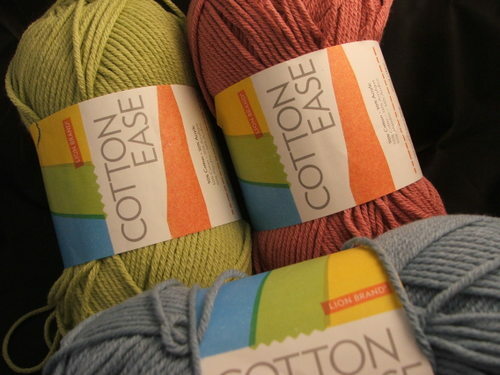 Yarn: Lion Brand Cotton Ease (50% cotton/50% acrylic); Lake, Lime, and Berry. Pattern: Basic hat from Ann Budd's A Knitter's Handy Book of Patterns, preemie size. I was a bit unhappy with the size and shape it turned out to be, thinking that it was too wide for its depth, but an emergency e-mail to Jeanne and I was tactfully informed that 1, babies come in all sizes and shapes (well, within limits), and b, even preemie babies grow and often continue to need little hats. Babies grow? Who knew? The uneven stitches smoothed out nicely after a quick run through the washer and dryer with the other laundry. In the interests of full disclosure, I must tell you that the New York Public Library mug does not contain coffee, nor even Sleepy Rabbit tea, as it did yesterday. Nope, that is Worcestershire sauce-tinted tap water, concocted to re-create the scene more accurately. Do I have mad food stylist skillz or what? #2 son asked me to knit him a pair of socks. Listen! Hear that? Hell freezes over. He has steadfastly refused any and all of my offers to for him. He's a fashionista in his own way, that boy, and his self-image brooks no mother-produced garments. Oh, except for that Dulaan-destined hat he swiped from me last winter. And that glow-in-the-dark scarf I so laboriously knitted him last year at his request and which he wore about twice. Grrrrr. But I am A Knitting Mother -- ya know, the ones who want to wrap the world in hand knits? So I immediately agreed to make him a pair of socks. No wool, he said, Wool is itchy. Okay, no problem, I said, and showed him a recently-received color card of Knit Picks Shine Worsted (60% Pima cotton/40% Modal®). He picked out the terra cotta and cream shown above. 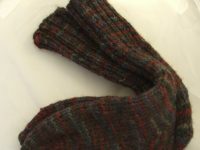 One reason I was able to agree so readily was that I had discovered the extreme speediness with which worsted weight yarn knits up into socks. Wham! Bam! Socks! He sent me a link to these socks to show how he wanted his to look. Don't guys have silly-looking legs? Why do they pose like that, so their legs look even sillier than necessary? Why do I care? * Diagram that (so-called) sentence! Soaring Eagles socks and mittens. 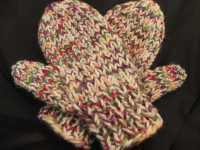 and two pairs of mittens using one strand of the Cleckheaton held together with one strand of Lion Brand Wool-Ease. 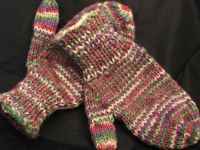 There was another pair of mittens from the same dark variegated yarn as the socks but I forgot to take a picture of them. I hadn't knitted mittens since my boys -- now 18 and 23 -- were toddlers, but I now feel like I can knit mittens for anyone out of any size yarn on any size needles. In my sleep. With both hands tied behind my back. Yeah, I'm Wonder Woman of the Mittens now. 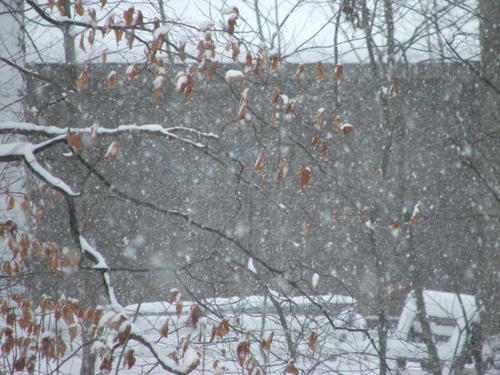 The view from my dining room window one day this week. 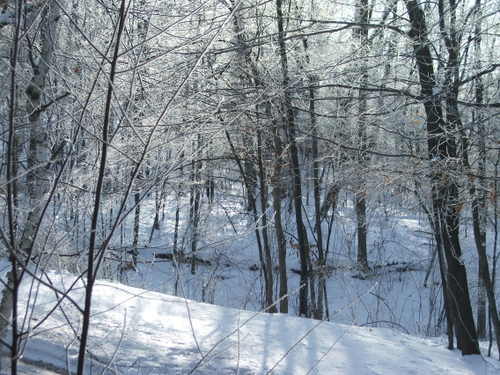 What you can't see is that the air was filled with tiny particles of ice that were blowing off the trees, so small as to be completely invisible except that they sparkled in the sun. Glorious. What does Wonder Woman Of The Mittens wear when the outdoors looks like that? The same thing that all Smart Women Of The Frozen Tundra wear. 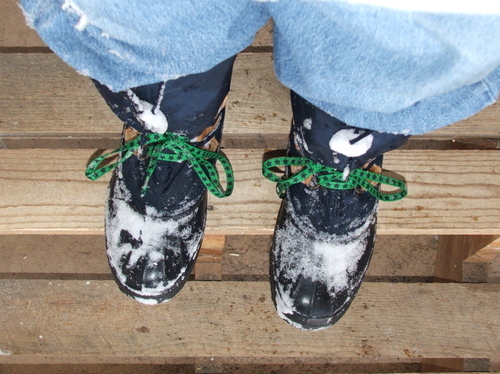 Sorels with fancy-schmancy laces. And what does the well-dressed cat wear? A bib that sets off his eyes, naturally. 7 weird things. Again. And mitten madness. Ruth tagged me for the 7 weird things meme. I did this once before, but this time I'm going to follow her lead and give you 7 weird physical things about myself. As she so eloquently put it, Ewwwww. 1. If I were a chicken I'd be labeled "Parts missing." Specifically, wisdom teeth, eye teeth, uterus, and ovaries. All extracted. I still have my tonsils and appendix, though. 2. When I was in high school I thought it would be really cool to be able to bend my index fingers only at the last joint, so when I had mono and was confined to bed for what seemed like forever I practiced until I could do it with the index fingers of both hands. I still can, but tragically no one ever asks for a demonstration. But you get one anyway. 3. My hay fever, which developed in junior high, was (not surprisingly) worst the year I lived in a basement apartment. Happily I seem to have outgrown it. 4. When our older son was born I had the worst of both worlds: 18 hours of labor, including an hour of pushing, then having a c-section. Good times. What I didn't know until later was that the anesthetist gives the mom the least possible amount of anesthesia until the surgeon cuts the cord; that way there is less possibility of the baby suffering undo effects, I guess. Anyway, I was out cold until the surgeon started cutting; then I could hear my husband chatting with the nurses (he is an RN and had worked with some of them) and feel the knife. It didn't hurt -- just felt like the edge of the blade was pressed against my abdomen -- but I was completely freaked. Yo! Awake here! Somebody! Wanna be unconscious! 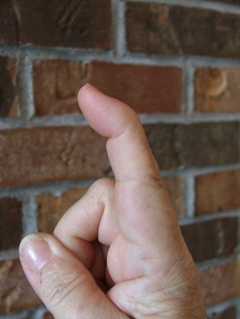 I could feel my husband holding my hand so I kept trying to squeeze it so he would realize I was at least semiconscious. No luck. My awareness apparently lasted only a few seconds because I was not aware of the actual birth. 5. (I'm running out here so I will expand this to include my family.) 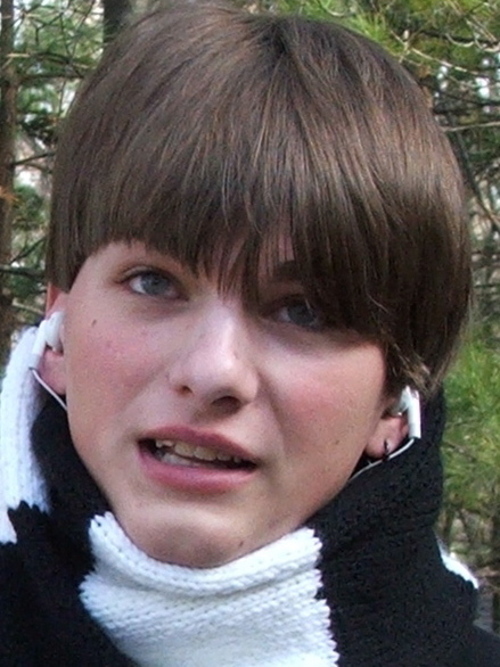 My older son had an expander to widen his upper jaw when he was about 8, but he later absolutely refused to have braces to correct his overbite. Said overbite is not apparent, but he can stick his tongue out even when his jaws are closed, by sliding his tongue over the top of the bottom incisors, down behind the front ones, and out. 6. Our younger son can stick out his tongue and touch it to the tip of his nose. Whether this will make him popular with the ladies is something I do not wish to consider. 7. My husband and older son are both left-handed. Both had somewhat traumatic births (see above), which I think I read somewhere can caused left-handedness. Our younger son and I are both right-handed, although I am a bit ambidextrous. As a reward for wading through the above blather, here is a gratuitous mitten shot. I have it on good authority, however, that the kids in Bartlesville, OK have appendages on their hands that require the knitter to create an appropriate cover for them. Damn. 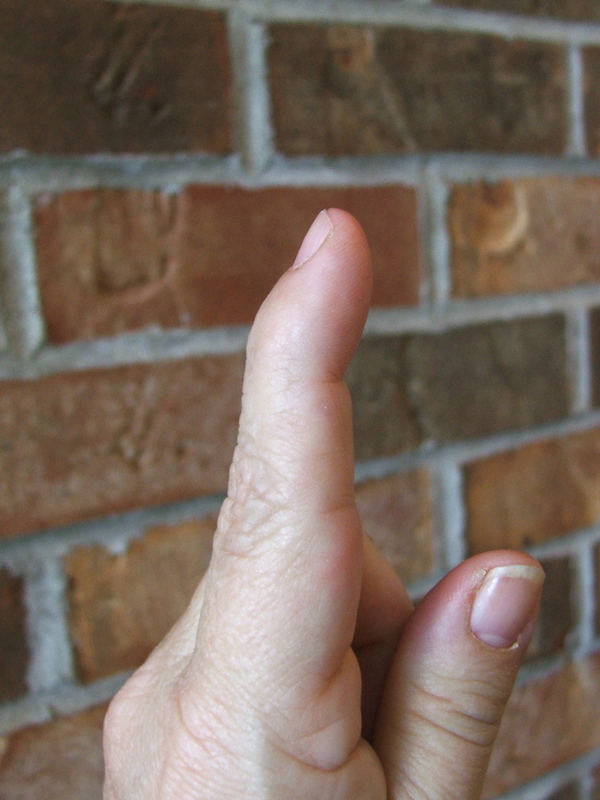 I hate to knit thumbs. I got home about 11:30 Monday night after my weekend travels to visit old friends. The dogs came with me. They are good travelers. Here they are in the back of the Aveo. 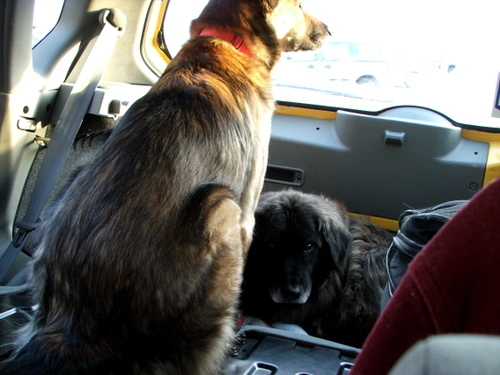 Mostly they slept, but sometimes Lucy watched over my shoulder so she could navigate. And whenever I got out of the car, when I came back she was in the driver's seat. Every single time. Light blue, pale lime green, and terra cotta -- this Cotton Ease will make dandy unisex striped preemie hats for Jeanne's annual January preemie hat extravaganza. 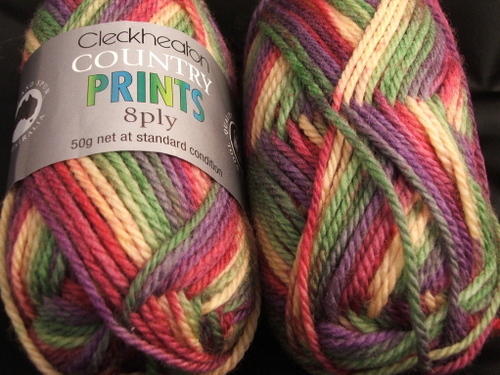 I was working on socks and mittens for the Soaring Eagles Project* while on my travels, and I picked up some red, green, and cream Wool-Ease to go with the variegated Plymouth Encore Colorspun I had along. No photos of that, too boring. I'll take pictures of the finished items before I mail them off. In Park Rapids to see my old friend Kathy (she IS my oldest friend -- I've known her since we were 14, and she is one day older than I am) I hit the jackpot. Turns out there is an excellent yarn shop in town, Monika's Quilt Shop. Kathy frequents the store because she is a quilter, so she gave me a tour of the vast selection of quilt fabrics. Then we walked into the yarn section. Heaven! 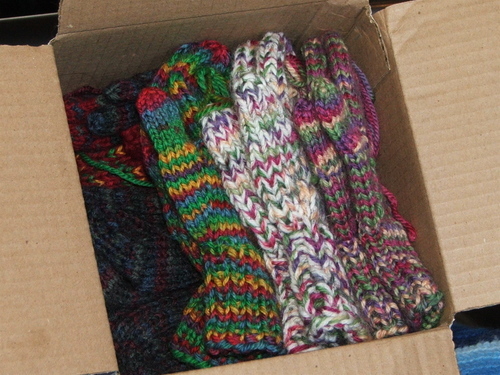 Cascade, Noro, Misty Alpaca, Malabrigo, and lots, lots more. Lovely colors, lots of knitted swatches, nicely arranged, a wide range of prices and qualities and brands -- truly everything a knitter might want. 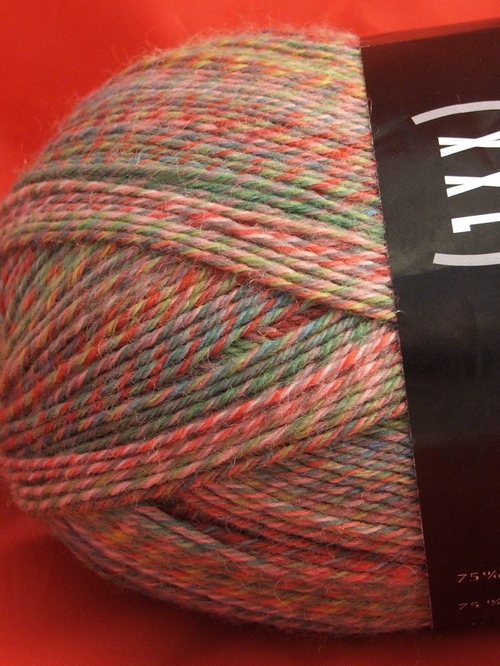 The Cascade 220 was $6.60/skein, which struck me as a very good price. It was amazing to me to find such a well-stocked yarn store with decent prices in my old home town. I kept telling Kathy I wanted to move it to my current stomping grounds. Yes, I'm going to double-strand Trekking. Life is too short to knit on US#0s. Or even US#1s. * Thanks to all of you who have stepped up to the challenge! I bet we will help Rachel reach her goal in time. It is winter here today. 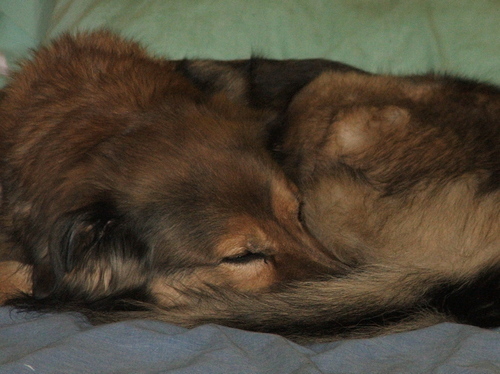 Wrap your tail 'round your nose and take a nap. Pay it forward. With a twist. My personal twist is that the winner may, if s/he so desires, designate that I knit something for their favorite charity/cause instead of for them personally. The actual objet d' knit will be of my own choosing after due consideration of each recipient's preferences with respect to color, fiber, care, etc. Is it really December tomorrow? 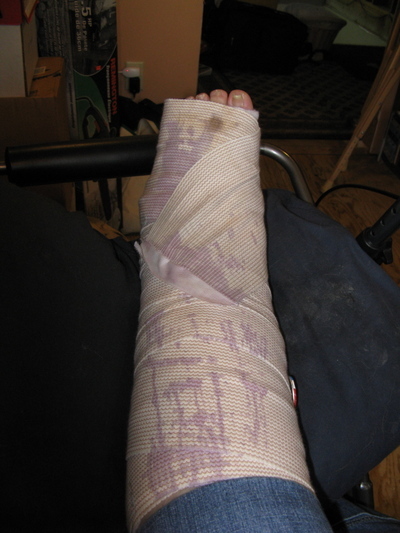 I guess that means I did the NaBloPoMo with only one missed day, and I didn't have real Internet access that day. So I am patting myself on the back and saying, See, Kath, you really can talk that much. 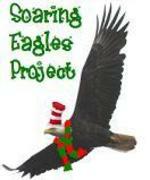 The Soaring Eagles Project desperately needs kids' mittens, socks, and slippers. 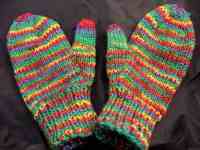 236 pairs of mittens and 69 pairs of socks or slippers by the December 17th deadline. There is a also Ravelry group. Holiday charity knitting project for disadvantaged elementary school aged children in Oklahoma. We were so wildly successful last year, let's give it another go! Last year a group of about 200 knitters came together from all over the world to give 425 children a wonderful handmade Christmas gift, a stocking cap. This year we will be helping another school in Oklahoma where I teach 5th grade. The details are not all together yet, but you can check us out over at http://soaringeaglesproject.blogspot.com and ask any questions you need to here! We will be adopting a low-income, high poverty school in Bartlesville, Oklahoma, Jane Phillips Elementary Eagles! 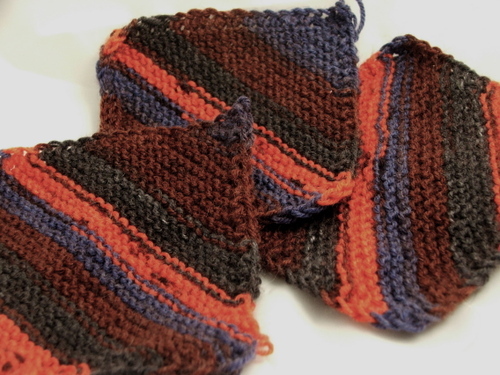 I made a couple pairs of worsted weight socks (4th sock OTN) and plan to make some mittens this weekend. Anyone else up for a pair of mittens or slippers or socks? You can contact RachelH at theprocrastiknitter@yahoo.com. I won another contest! This one was at Big Alice's -- look at the great sock yarn she sent me! Thanks, Carrie! And look at the sock that someone in Ravelry (wolldruide) is making from a slightly different color of this yarn -- I don't know if I will ever make these socks, but wow! aren't they something to aspire to? Pattern is from Charlene Church's More Sensational Knitted Socks. That's Paton's Soy Wool Stripes, cast on 96 st on size US#6s. I've been wearing it and loving it. Wait, what is that weird tube thing I'm using? For those of you who were freaked out by yesterday's serial killer post, let me assure you that Matthew's remark was made in jest. It was last July so I don't remember the full context; not to worry, though, no living creatures were harmed in the making of the funny. Seriously, is this the face of a serial killer? Colors are true in the first picture, which was taken outdoors in natural light. 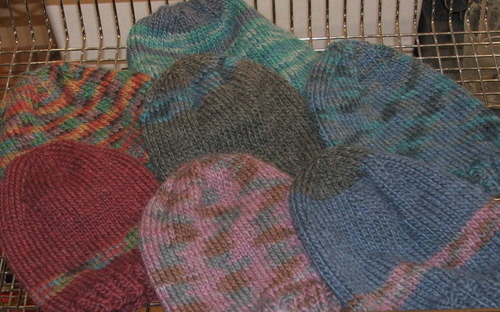 Although I was supposedly using exactly the same pattern and the same size needles for all, the seven hats somehow ended up being seven different sizes. Oh, well, they will each fit someone. 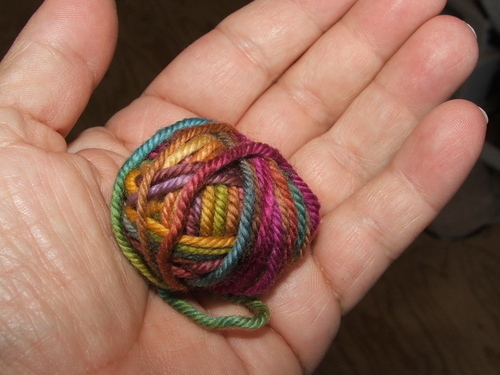 The yarn is a lightly spun single ply, lovely and fluffy and soft, a wool/acrylic/alpaca blend. 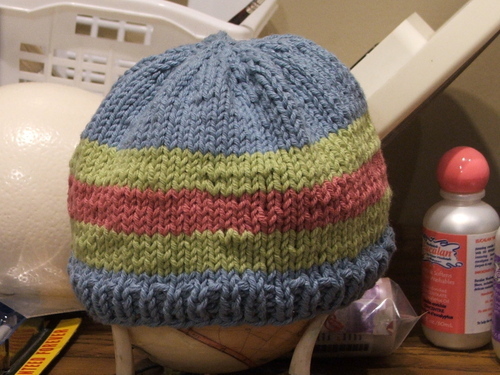 I knit the hats variously on US#7, 8, and 9 needles, depending [apparently] on the phase of the moon. 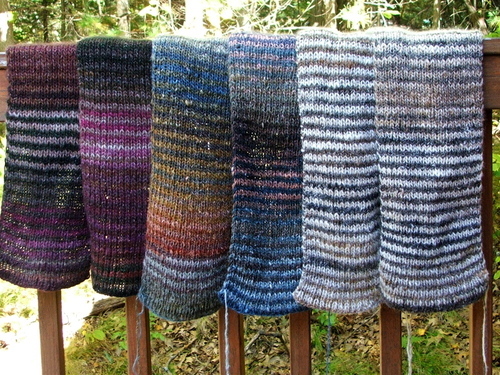 I have become addicted to the striped Noro scarf, as you can clearly see above. The one at the left has been seen here before; it is for the Red Scarf Project and was actually knit from Plymouth Boku. The other two are the real thing, both knit from Noro Silk Garden and both intended as Christmas presents. I also have 4 more skeins of Boku lying lightly in my stash, intended for a scarf similar to the first one but with a bit more red, and intended for myself [insert selfish giggle]. I cannot describe in words how much fun it is to make these scarves, to watch the different colors come out of the ball and onto the needle, to see what color falls next to another, to see how they contrast and complement each other. It is sheer magic. I have decided that Noro SG is okay with me. Irregularities in the yarn are were previously annoying are now charming; now it is reminiscent of handspun rather than incompetence. In fact, when I was working on the rightmost scarf above in the car on the yarn crawl a couple weeks ago, every one of the Fiber Guild spinners asked me independently if the yarn were handspun. 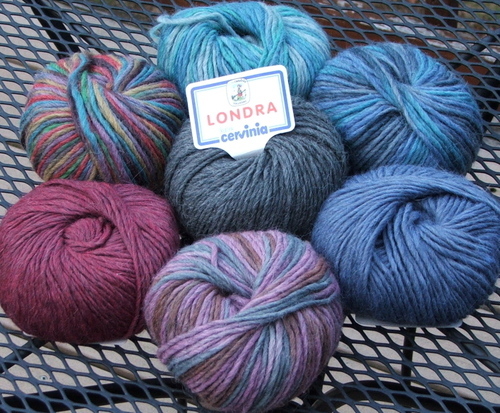 I just wish the [significantly cheaper] Boku came in as many color variations as the Noro. 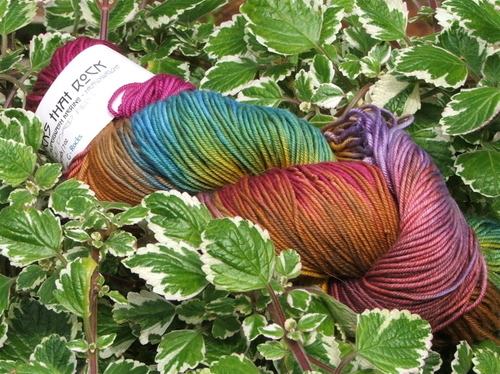 Yarn: Noro Silk Garden, most of 2 skeins each of colors 204 and 249, bought on eBay. 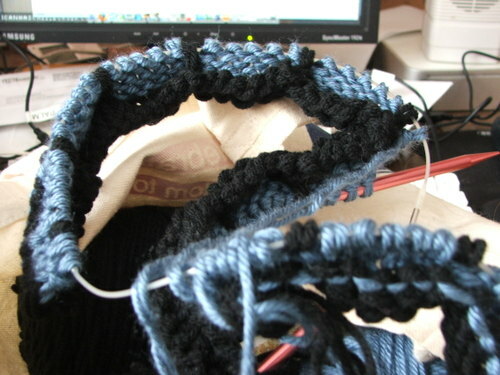 Pattern: Cast on 39 st. 1x1 ribbing. Slip 1 purlwise wyif at beginning of each row. Edited to add: Work 2 rows from one color, then 2 rows from the second color. 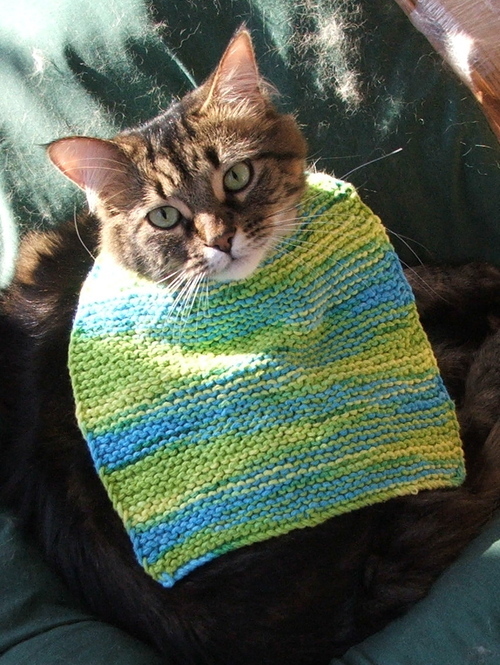 Repeat until scarf is long enough or you run out of yarn. 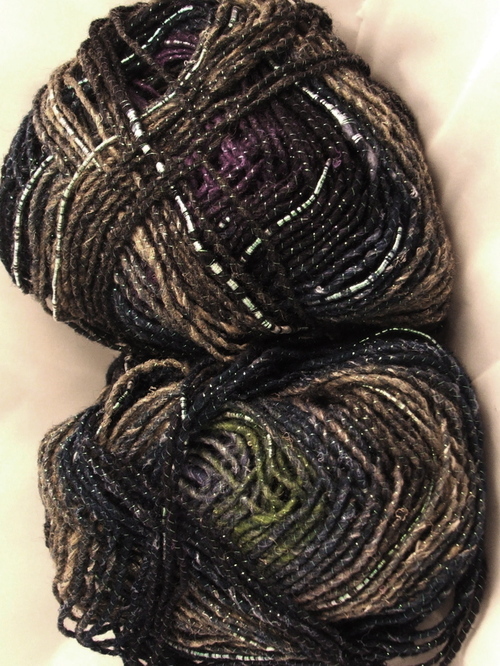 Yarn: Noro Silk Garden, most of 2 skeins each of colors 267 and 269. I'm going back to work at the accounting firm for a few weeks to help in the pre-October 15th mini-busy season. 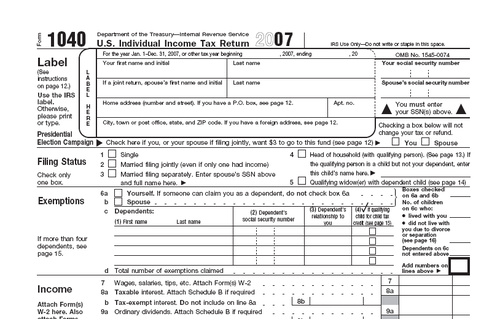 (October 15th is the date that individual returns that were extended last April are due, plus the last date that 2003 amended returns can be filed.) 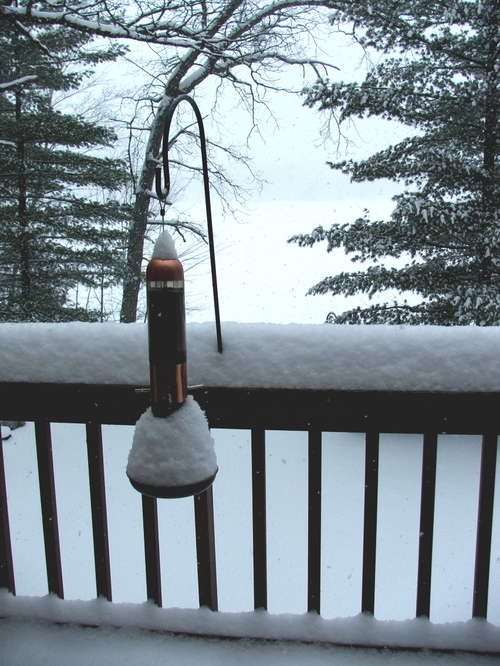 So I will be back in Minneapolis, hanging out with my orange cat Tabby, and coming back here to the lake on weekends. It's all good: I like the work, I like the people, and the extra paycheck means Smokey can let up a little at his job and be able to work on the projects he wants to finish up before winter. 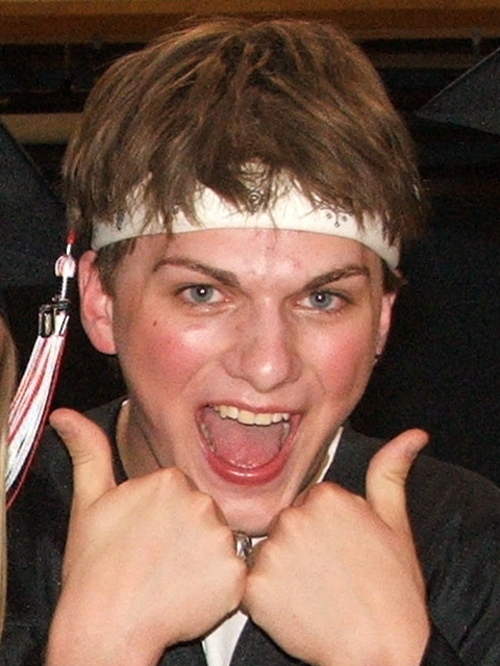 Matthew got a callback for an internship at a video post production company in Minneapolis. I was able to help him get his foot in the door because my cousin runs the company, but they use interns regularly, plus he has spent time there before and they know his work. He will probably work there for most of the next year. I don't remember if I have talked about his plans before. He graduated from high school last spring. He wants to go into graphic design and advertising, and his educational plan is to attend the Minneapolis College of Art and Design. But although he is very bright, he is not a scholar, and he didn't want to move directly from high school to college -- he wanted a year off from the pressure of assignments and homework. So this internship/job is exactly what he wanted and needed. He will live in the basement of our Minneapolis house. We both start Monday morning. We are all smiling. Life is good.